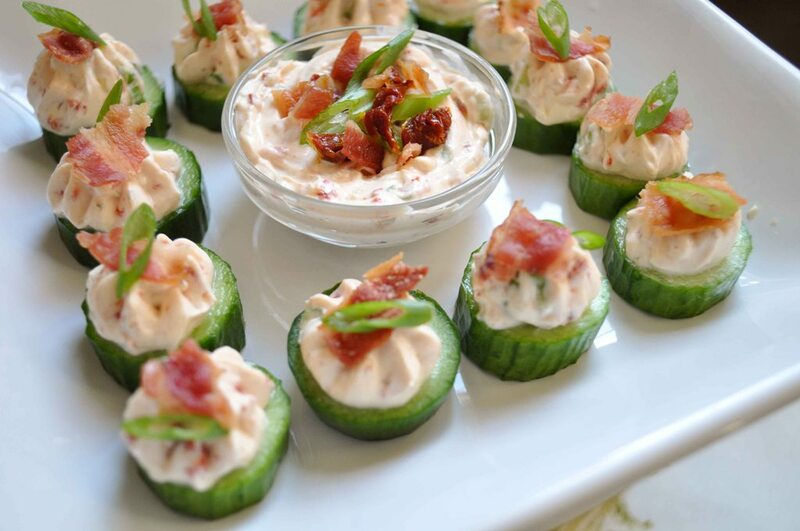 When I was planning our menu of New Year's Eve appetizers I wanted to include a little something green. But I wasn't sure what. I had planned to make Ina Garten's sun-dried tomato dip with rosemary crackers. I was also making a baked sweet onion dip with crackers and rosemary cheese straws. Too many carbs. I opened up the fridge for inspiration. Cucumber is green, cool and crisp....a lot like lettuce, right? A play on the BLT came together in this little crunchy, creamy, tomatoey bite. It was a refreshing veggie addition to our all appetizer dinner. These flavorful bites are easy to put together and can be made ahead and stored in the fridge. I used a decorating tip to pipe on the sun-dried tomato dip. If you don't have a tip, you can place the dip in a zip top bag and cut the corner off and pipe it on the cucumber slices. It doesn't need to be perfect because it gets topped with bacon bits and sliced green onions. The sundried tomato dip recipe makes a lot of dip. You can serve it with crackers or cut up veggies. It would also make a nice spread on a turkey sandwich or really gear up a classic BLT sandwich. Quantities can vary depending on how many you want to make. I cut up 4 Persian cucumbers and used 2 slices of bacon and 1 scallion for Hubby and me. Place sun-dried tomato dip in a pastry bag fitted with a large star attachment. Pipe a dollop of dip on each cucumber slice. It doesn't have to be perfect because....the next step is to top each bite with a piece of bacon and sprinkle with scallions to garnish. These can be assembled ahead and stored in the fridge until you are ready to serve. 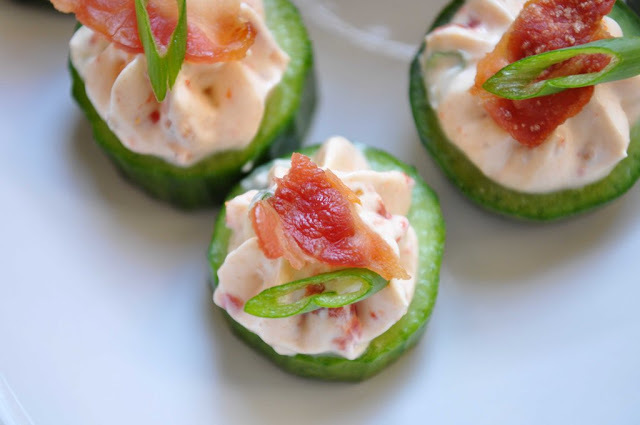 Love this twist on a classic BLT and a great alternative to the standard cocktail cracker!!! That looks so YUMMY! LOVE the blog girlie! Plus, they look so adorable! I'm always looking for a great party dish. I think I found one. These look sooooo good! Great photos too. 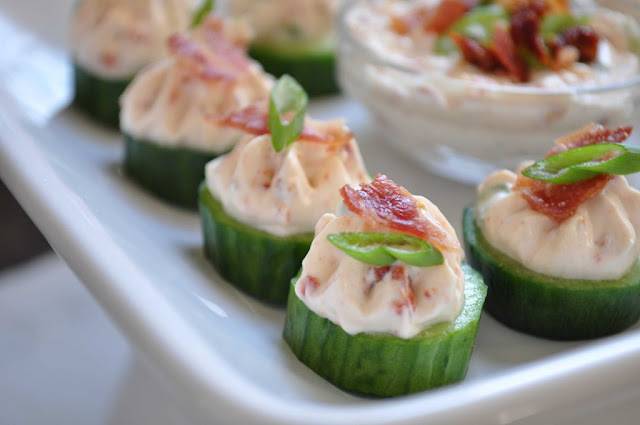 What a cute little appetizer, I love these! Shane would probably rebel if I tried to serve them to him, so I'll have to wait for an occasion when we have some friends over. My family loved this dip! I mixed in real bacon bits just before serving.